The oral antifungal drug terbinafine appears to be slightly better than alternative ‘azole’ drugs for treating fungal toenail infection. Fifty-eight percent of people had a normal nail appearance after a treatment course compared with 47% taking ‘azoles’. Both drug classes were more effective than placebo and had similar side effects.Current guidelines recommend terbinafine or itraconazole as first-choice treatments, but consider terbinafine more effective. Fungal nail infection is thought to affect somewhere between two and 14% of the adult population. 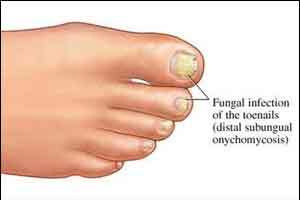 It is most common in older people and those with diabetes.Most cases of toenail infections (about 80%) are due to dermatophyte fungi such as Trichophyton; other fungi include Aspergillus, Scopulariopsis, Fusarium, and Alternaria. Some are highly resistant to treatments. Toenail infections have a low complication rate, but they may affect the function of the nail and quality of life. Topical treatments are commonly used, but they have a low success rate. The most common oral antifungal treatments are terbinafine and itraconazole (an azole drug). Drug treatment can be costly to the NHS as a standard course of oral treatment is three months, and it may take as long as six months to a year to treat infection successfully. This systematic review pooled 43 randomised controlled trials including 9,730 people and comparing oral antifungal treatment with another active treatment or placebo.Seven trials compared terbinafine with placebo, nine compared itraconazole with placebo and 17 compared these two drugs with each other. Other studies assessed griseofulvin and other ‘azole’ drugs. Treatment duration ranged from four months to two years. It was found that Terbinafine was more effective than azoles. Forty-seven percent of people who took azoles were cured, based on normal nail appearance, compared with 58% who took terbinafine (relative risk[RR] 0.82, 95% interval [CI] 0.72 to 0.95; 15 studies, 2,168 people). People taking azoles were similarly less likely to achieve a mycological cure as defined by negative results on microscopy or culture: 53% vs 68% with terbinafine (RR 0.77, 95% CI 0.68 to 0.88; 17 studies, 2,544 people). Adverse effects and recurrence rates were similar between the two drugs. The results support guidelines recommending terbinafine as the first choice for treatment unless contraindicated.Antifungals are available in oral and topical forms. Topical antifungals have long been thought less effective, but the review did not gather evidence to confirm this.